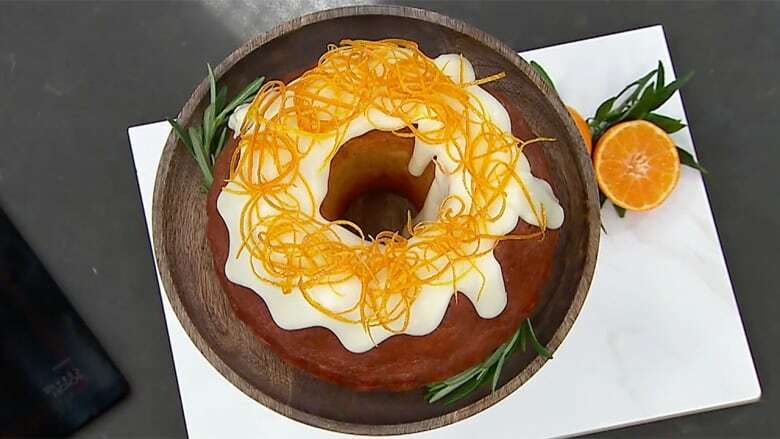 Rosemary and orange are a match made in heaven when it comes to this bundt cake! Rosemary and orange are a match made in heaven when it comes to this bundt cake! The dessert gets its super moist texture from olive oil, sour cream and an orange syrup that gets soaked into the cake after baking. Shahir's recipe pairs perfectly with a coffee or tea — and it's impressive enough to bring to a potluck! Preheat oven to 350F. Grease a 10 cup bundt pan with nonstick cooking spray. Combine flour, baking powder, baking soda and salt with a whisk in a large bowl, set aside. In a separate bowl, whisk together sugar, sour cream, eggs, olive oil, rosemary and orange zest. Pour the wet ingredients into the dry and fold until combined. Do not overmix, a few streaks of flour are fine. Bake 45-50 minutes or until a skewer inserted in the middle comes out clean, rotating in oven halfway through. Allow to cool in pan for 30 minutes, and then turn out onto a wire rack to cool completely. Using a vegetable peeler, peel the zest of the orange off in long strips, starting at the stem and taking care not to cut into the bitter white pith. Cut the strips of zest into a fine julienne. Combine the sugar and water in a small saucepot, and bring to a simmer over medium heat. Add the julienned orange zest and simmer until zest is softened, approximately 15-20 minutes. Remove from heat and set aside to cool. When zest is cooled, remove it from the syrup and drain on paper towel. Add the juice from the oranges to the syrup and set aside for assembly. Salted Butterscotch Pudding Cups. We need a minute too.